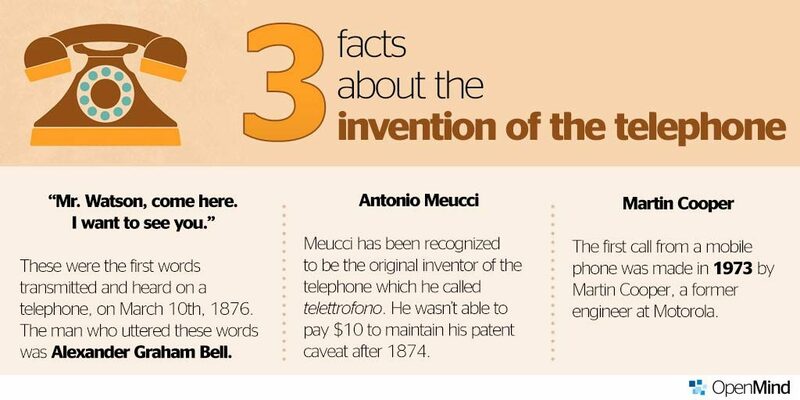 Start The Telephone War: Was it Graham Bell’s Invention? “Mr. Watson, come here. I want to see you.” Popular knowledge assumes that these were the first words transmitted and heard on a telephone, on March 10th, 1876. The man who uttered these words was Alexander Graham Bell, the American born in Edinburgh (UK) who is often cited as the inventor of the telephone. And the man who clearly heard his message in the next room was his assistant, Thomas Watson. However, summarized in this way, the story of the invention of the telephone would be to forget history. It is often said that science advances on the shoulders of giants; the great discoveries and inventions rarely occur because of the isolated achievements of one great mind, but are built on the prior progress of many. 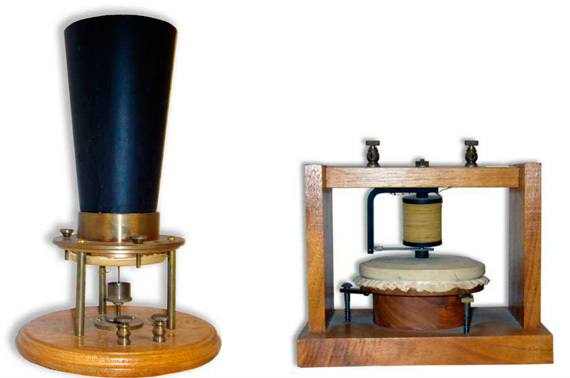 In the case of the telephone, there were several pioneers who made advances toward the goal of the simultaneous transmissions of sounds and voices. The term “telephone” owes its existence to the German Johann Philipp Reis, whose first sentence in a device that he never succeeded in perfecting was much more extravagant than that of Bell: “Das Pferd frisst keinen Gurkensalat“, or “The horse does not eat cucumber salad.” This statement, and not that of Bell, should receive credit for being the first telephone voice transmission in history, according to what Bernard Finn, the Curator Emeritus of the Electricity Collections at the Smithsonian Institution’s National Museum of American History, has told OpenMind. “It seems clear that Philipp Reis transmitted voice through his device several years before Bell,” said Finn, who has written several books on the history of electrical technologies. 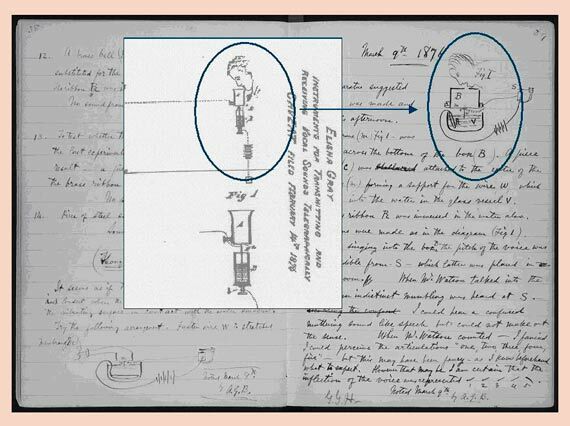 Competition was so tight that on the same day that Bell presented his patent application in the Washington patent office, on February 14th, 1876, another person did the same; it was the engineer Elisha Gray, who, in his patent caveat –a sort of provisional patent valid for one year– included a liquid transmitter of variable resistance, a breakthrough in the quest for a functional telephone. On that day a legal, technical and historical battle began which has kept scholars occupied for almost a century and a half trying to answer various questions: Which patent arrived first at the patent office? Which of the two inventions was first? And, above all, did Bell copy Gray’s idea for a liquid transmitter after having access to his rival’s patent caveat? Was this the key that enabled Bell to convey his first words by telephone on March 10th, 1876? The hypothesis of plagiarism has been advocated by authors like Edward A. Evenson, who in his book The Telephone Patent Conspiracy of 1876 (2000) arrived at the conclusion that it was Bell’s lawyers, not the inventor himself, who copied Gray’s design in the version of the patent that was finally deposited by the Scotsman. In The Telephone Gambit (2008), Seth Shulman widely documented the plagiarism, which was made possible by means of bribery of a patent examiner named Zenas Wilber. In the opposite camp, the supporters of Bell argue that his work was based on his own previous achievements and that Gray’s transmitter was not functional. In any event, on March 7th, 1876 Bell received the grant of the patent. For Finn, however, Bell’s alleged plagiarism “does say something about his character (or that of his lawyers), but it has nothing to do with the invention.” Although the Scot was inspired by Gray’s liquid transmitter, this claim of the patent was not accepted, and indeed Bell subsequently changed his system. “He had problems with the device (due, I think according to my own experiments, to the decomposition of water), and he returned to the induction transmitter.” Therefore Finn believes that plagiarism was not crucial to the work of Bell, but “rather a distraction” and he resolves the controversy with a Solomonic judgment: “Bell saw the commercial possibilities more clearly than Gray, applied for a patent and continued to work on his invention, which was introduced the following year.” “The fact that Gray deposited a patent caveat suggests that he was not sure of the scope of what he was doing; he did not have that vision of the future and let the critical time escape,” judges Finn, who published an article on the controversy of Bell and Gray in the journal Technology and Culture a few years ago.